Northbound Interstate 83 at the split with the York, Pennsylvania Business loop (Exit 15). Photo taken 06/21/12. Interstate 83 comprises an older freeway running north from Baltimore, Maryland to Harrisburg, Pennsylvania. The freeway within the city of Baltimore is locally maintained, while the freeway throughout Baltimore County is maintained by the Maryland State Highway Administration. Within Pennsylvania, I-83 leads north to York, where it takes an old bypass of U.S. 111 to the east. The freeway continues from there through hilly areas east of the Conewago Mountains to Cumberland County and the Harrisburg area. 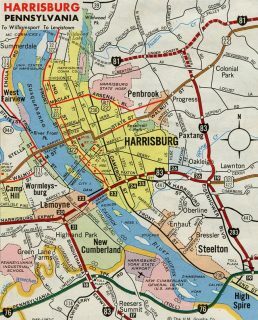 Turning east, I-83 spans the Susquehanna River to the south of Downtown Harrisburg. It turns north again at the Eisenhower Interchange to combine with U.S. 322 north to Progress, Colonial Park and the northern terminus at Interstate 81. 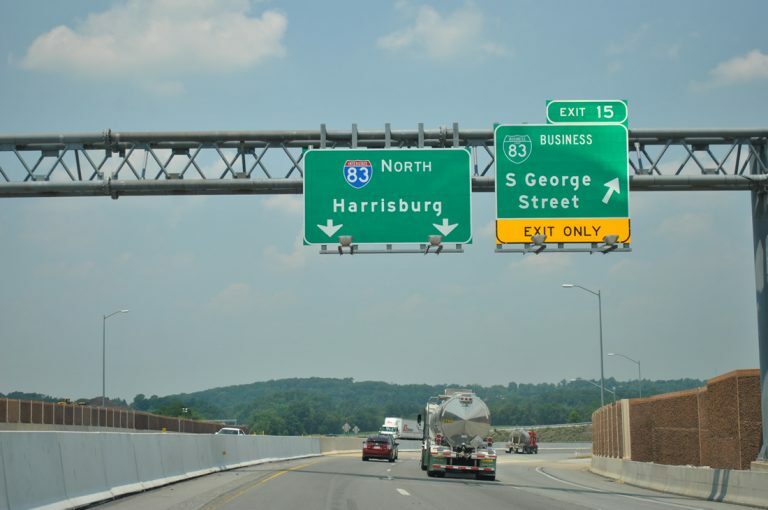 A major overhaul and upgrades of Interstate 83 through Harrisburg, Pennsylvania is underway as part of the I-83 Capital Beltway Project. Separated into four sections, construction addresses aging pavement, dated interchange design and capacity issues. Work completed includes the I-83/PA 581 Interchange Bottleneck Safety Project, which addressed safety issues and congestion at the York Split exchange between the two freeways. A second lane was added for the I-83 mainline movement and weaving traffic patterns were addressed with ramp modifications and replacements. This interim improvement was completed in Summer 2015; long term plans call for constructing a systems interchange in place of the current trumpet at the York Split. I-83 East Shore Section 1 widens Interstate 83 from north of the Eisenhower Interchange with I-283 south and U.S. 322 east to Interstate 81. Work also replaces bridges, adds sound barriers and further reconfigures the exchange with U.S. 22 at Exit 50. Split into two contracts, Section 1 work runs through late 2021. I-83 East Shore Sections 2 and 3 will address the dated Eisenhower Interchange and expand the freeway between the Susquehanna River and Paxtang. Construction on these sections could start in 2022. 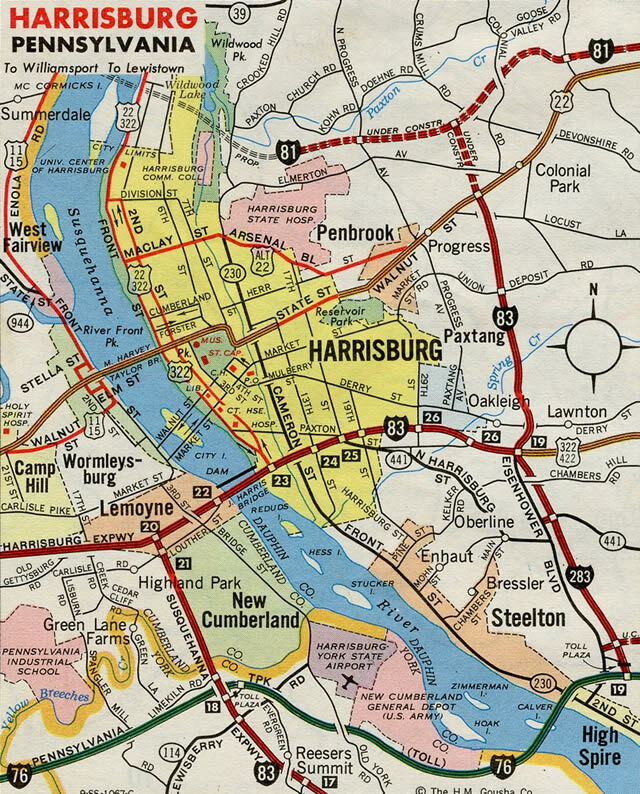 Interstate 83 replaced U.S. 111 from Baltimore north to Harrisburg. The southern terminus was to have linked with Interstate 95 in Baltimore. An early plan took I-83 to a conclusion at I-95 within the Fells Point community. These alignments were later changed to move I-95 south to the Fort McHenry Tunnel and extend I-83 east through Canton. Stub ramps were built at the I-95 interchange with Boston and O’Donnell Streets for the planned junction with I-83. However as was the case with many Baltimore freeway plans, this portion of I-83 was canceled due to community opposition. 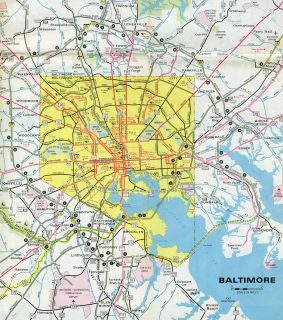 The portion of Interstate 83 shown as proposed on the 1976 Maryland Map was never built. Interstate 70 east of Cooks Lane and the western leg of I-170 were equally unconstructed. Interstate 83 northbound entered a full cloverleaf interchange (Exits 50A/B) with U.S. 22 (Jonestown Road) one mile south of I-81. Started in June 2016, the I-83 East Shore Section 1 project rebuilt this exchange into a parclo interchange, replaced the Jonestown Road overpass, and prepared the roadway for expansion to eight overall lanes. Photo taken 06/20/12. I-83 expanded to three northbound lanes from U.S. 22 to Exit 51 for Interstate 81. Overheads pictured here were mounted on the Elmerton Avenue overpass. Contract 1 work for the I-83 East Shore Section 1 project replaced this span to accommodate widening in Contract 2. Expansion work runs from late 2018 to late 2021. Photo taken 06/20/12. Crossing over Valley Road, Interstate 83 north & U.S. 322 west reach the three-wye interchange (Exit 51) with Interstate 81. U.S. 322 joins I-81 south for 2.25 miles, where it combines with U.S. 22 on a freeway extending north to Duncannon and Lewistown. Photo taken 06/20/12. Traffic partitions into high speed ramps for Interstate 81 north to I-78 east for Allentown, and Wilkes-Barre and I-81 south across north Harrisburg to I-76 (Pennsylvania Turnpike) at Carlisle. Photo taken 06/20/12. U.S. 322 accompanies Interstate 81 north from a systems interchange with U.S. 22 near the Uptown neighborhood of Harrisburg. The freeway meets Progress Avenue and I-83 south over the succeeding 1.5 miles. Photo taken 06/20/12. The auxiliary lane from U.S. 322 east drops at Exit 69. I-81 & U.S. 322 continue another mile to the three-wye interchange with Interstate 83 (Harrisburg Beltway) south. Photo taken 06/20/12. I-83 and U.S. 322 combine southward from I-81 between the Progress and Colonial Park communities to the Eisenhower Interchange with I-283 at Lawnton. U.S. 322 turns east there to Hershey. Photo taken 06/20/12. Two lanes separate for both I-81 north to I-78 near Jonestown and I-83 south to Downtown Harrisburg and Harrisburg International Airport (MDT) via I-283 / PA 283 at Middletown. Photo taken 06/20/12. Interstate 83 navigates through an S-curve below grade and turns south along side the Fallsway to Exit 3 at the Chase Street overpass. An expressway ends two mile sign was formerly posted here. Photo taken 06/27/10. Anchored by the Baltimore World Trade Center4, the Downtown Baltimore skyline appears along the elevated lanes of Interstate 83 southbound ahead of the Orleans Street viaduct (U.S. 40). Exit 2 lowers from the left side of the Interstate 83 to Pleasant Street at Holliday Street south. Photo taken 06/27/10. Interstate 83 shifts southeast on the final 0.3 miles to President Street at Fayette Street. The freeway was originally planned to turn eastward from roughly this location and continue to Interstate 95. Photo taken 06/27/10. The last confirming marker for Interstate 83 stands along the viaduct above Holliday Street. This state-named shield was still posted as of July 2018. Photo taken 06/27/10. Speed limits reduce to 35 miles per hour at the expressway ends sign bridge above North Gay Street. Photo taken by Tim Reichard (09/14/02). Exit 1 comprises a right turn from the end of I-83 to Fayette Street. Baltimore City Hall lies two blocks to the west. Photo taken by Tim Reichard (09/14/02). President Street, a four to six lane urban boulevard, extends south from the Jones Falls Expressway 0.6 miles from Fayette Street to Alceanna Street at Fells Point. Photo taken 06/27/10. President Street northbound at Baltimore Street, one block south of the Jones Falls Expressway. Baltimore Phoenix Shot Tower rises from the ensuing block to the east. Photo taken by Tim Reichard (09/14/02). Interstate 83 begins from the intersection of President and Fayette Streets. The Fallsway separates from the freeway ahead and acts as a service road for I-83 northward to Guilford Avenue and Maryland 2 (Calvert Street). Photo taken by Tim Reichard (09/14/02). Fayette Street westbound at Interstate 83 north and President Street south. Photo taken by Chris Elbert (07/06). Fayette Street angles southwest from the world-renown John Hopkins Medical Campus to connect with Interstate 83 (Jones Falls Expressway) north ahead of Downtown Baltimore. Photo taken 06/20/12. Winding northwest from Fayette Street along a viaduct system, Interstate 83 commences with two northbound lanes. Exit numbers along the ensuing stretch use a sequential system. Photo taken by Chris Elbert (07/06). The first reassurance shield for Interstate 83 was this assembly posted ahead of the Orleans Street viaduct (U.S. 40) and Fallways on-ramp. It was removed by 2007. Photo taken by Tim Reichard (09/14/02). Continuing north between Guilford Avenue and Fallsway, Interstate 83 approaches the Chase Street off-ramp (Exit 3) at this confirming marker. Photo taken 06/20/12. Inlow, Mike. Personal Email, AARoads feedback: I-83 in Baltimore. Baltimore’s World Trade Center is the tallest pentagonal building in the world with 32 stories. Pennsylvania Highways: Interstate 83 Business Routes.